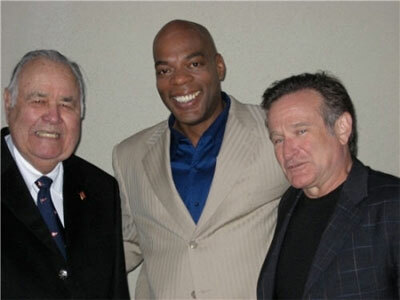 This week the interview is with Alonzo Bodden. He was the winner of Season 3 of NBC's Last Comic Standing and currently hosts 101 Cars You Must Drive. Andrew: What are you doing today? Alonzo: Today I am in beautiful Pella, Iowa. This is the part of show business that nobody brags about, nobody tells you about. Where you get up at 3:30 in the morning, you drive to LAX, you catch 6:30 flight to Denver, you lay around a while, you catch another flight to Des Moines, you rent a car and drive another 1 hour and end up in some town called Pella. To give you an idea of hour small Pella, Iowa is, outside of my room, and I am not making this up, is a view of the windmill. Andrew: (laughs) Was their a moment in your life that you knew you were funny? Alonzo: I was teaching aerospace. I was working at McDonald-Douglas training new workers and I just had more fun making them laugh then teaching them the serious stuff. So it was over a year, where I was thinking about it, but once I tried it that was it. I was hooked from day one. Andrew: So that had to be a tough leap. I mean leaving a career at McDonald-Douglas compared with comedy had to be a stretch financially. Alonzo: It wasn't like leaving was my choice. They were doing lay-offs, but what I decided was that I wasn't going to go back to aerospace. However, it was tough because when you start out in comedy, when you make 50 bucks in a night you are ecstatic. So obviously, if I received a steady paycheck on the back burner I would not have committed as much to comedy. Andrew: Was your family supportive of this decision? Alonzo: They were all surprisingly supportive, except for ex sister-in-law. Who's words were and I quote "we are not lending him money." Andrew: (laughs) What makes you laugh? Alonzo: Usually, insanity. Over the top goofy, crazy stuff or little ironies that people don't see and I'm like how do you not see that? That's the stuff that really makes me laugh, but there are more things that make me angry than makes me laugh. Andrew: What makes you angry? Alonzo: The fact that the presidential election is covering Paris Hilton. The fact that this T. Boone Pickens, the oil billionaire, is talking alternative energy, but he owns a windmill company. So if we switch to wind power, he makes another billion dollars. Oh yeah, you care about the environment (laughs). You know what makes me angry is that no one is paying attention. That's what gets to me. All this crap is going on and no one is paying attention. Andrew: Maybe we're all to busy working to see what is actually happening to us? Alonzo: That was a fair excuse for the first Bush administration, but once he was reelected, then it was like, nope, we deserve what we get. I would say the same thing with Arnold. You elect him twice, now you deserve it. The first time you can say you were fooled. Andrew: Have you been watching the Olympics? Alonzo: I always watch the Olympics. I love watching the off beat events. I like watching judo in the afternoon because how often do you see judo? Alonzo: My favorite thing about the Olympics is 'the sad story of how you got there? There is no Olympic athlete who has a happy life story. Whenever they do one of those in depth interviews, somebody in their family has had a disease that you never recover from. There has been a terrible accident. It's just hilarious. Andrew: Are you saying NBC is using our athletes to market sad stories? Alonzo: Well they actually interview you when you are going on to the Olympic team, to make sure you have something horrible in your background. If you say "My mother and father have been married for 40 years, and my brother has been raising his kids." "Oh really? I don't think you're going to be on this team." And then you have another guy who runs a little slower and you and he says "My mother has the plague." "Well congratulations! Welcome to the Olympics." Andrew: (laughs) Well, I have a multiple choice question for you. What is important about the Olympics? A) The Gold medal count, B)The total medal count, or C) Just the fact that we are competing? Andrew: Tell me about 101 Cars You Must Drive. Alonzo: It's really fun, these cars are different iconic cars throughout history that have significance. It's not just about Lamborghini's, Ferrari's, and Corvette's because that would just be another exotic car show. There are things in there like the Edsel, which is a great example of what not to do. The Volkswagen Bug, the most popular, most recognized car on earth. It is just a bunch of cars that for some reason, have a significance. And I get to drive them and make fun of them. We get some really funny ones, and we get some real characters who own these things. If you own a 1972 Citroën, well you've got a story to tell. So that is what the show is about. Andrew: Where and when does this air? Alonzo: It is Monday nights on The Speed Channel, 9:00 Eastern, 10:00 Pacific. And you do have The Speed Channel. It's just one of the channels you never watch, like the Golf Channel, or Home and Garden T.V. But it is part of basic cable, just go under your guide, it's in there. Andrew: Last Comic Standing: You were the Champion on Season 3. Can you tell me about that experience? Alonzo: Well the part would be that I am the unknown winner, because NBC never televised the finale of Season 3. The good part was that our season was called "The Best of The Best", so it was 10 comics from Season 1 versus 10 comics from Season 2, so basically, it was like I won the All-Star game, which was a great feeling for me. The show was just a great run for me. Besides the recognition from fans, the trippy thing is the recognition in the comedy world like going to The Comedy & Magic Club, and Ray Romano was there, and he knew who I was. That was a trip, things like that were really cool. And I made some great friends, with the other people on the show, we are still good friends, and that was cool. Good experience. $250,000 didn't hurt either. Andrew: (laughs) Now are you still involved with the show in some capacity? Alonzo: No, last season I was one of the scouts, but this season, I didn't have any official capacity. Andrew: Can you compare and contrast The Comedy & Magic Club to other clubs and experiences? Alonzo: The great thing about the Comedy and Magic Club is Mike and Richard who are, I would say "old school", but I don't even know if it would be "old school" anymore, which is nice and respectful to the comics in the way that they are. I think what happens is that because they like comedy and comics, (and this is true for the entire staff), they make it good for the comics. In turn, the comics have a good time, and we're having a good time, we are funnier. So the show is funniest for the audience, because we, the comics like being there, as opposed to some clubs where it's a grind. It is a great club. It truly is what we call an "A-Club" on all levels. Alonzo Bodden will be headlining The Comedy & Magic Club Wednesday, April 1st & Saturday April 11th. Resrevations required. comedyandmagicclub.com or (310) 372 1193.